To be the premier institution for the advancement of professionals in the research, development, and innovation in geomatics, spatial analysis, and planning in support of sustainable management of land and marine resources in the Caribbean. Land Surveying is the general term used to refer to several sub-disciplines, including: Geodetic surveying – the theoretical basis and the control framework for all other surveys. Topographical surveying – mapping of the physical and cultural features on the earth's surface. Engineering and mining surveying – the provision of spatial data for the design, construction and monitoring of engineering and mining works. Cadastral surveying – delineation and parcellation of property rights and the establishment of a base for effective land administration. Hydrographic surveying – offshore position fixing, tidal studies and mapping of water features and coastal areas. Land Surveying provides spatial (geographical) and attribute information in the form of maps and other manual records (analogue) or computer-compatible (digital and attribute) formats to meet the multitude of user needs. The products of land surveying are invaluable tools for informed decisions in all spatially oriented land and marine-based activities. Satellites and computers have changed the technology of measurement, processing and presentation of information used by the surveying profession. Simultaneously, spatial information and information theory and practice have acquired greater emphasis in land surveying. Land Surveying requires a firm background in mathematics, computer science, information systems, law, planning, valuation and management as well as surveying disciplines of geodesy, cadastre, engineering surveys, photogrammetry, remote sensing cartography and hydrography. 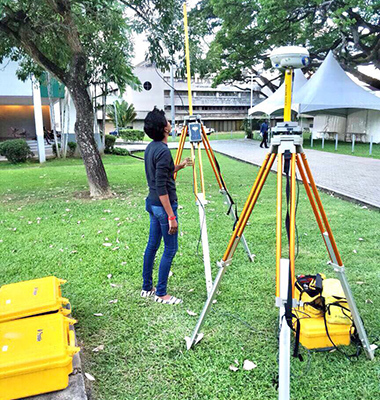 The graduate land surveyor can be usefully employed in many institutions other than those specially dedicated to the surveying profession, for example, employment opportunities exist in land administration, land development, engineering, local authorities, utilities and forestry.